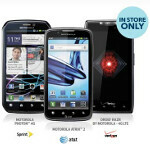 Best Buy has a deal for those interested in buying the Motorola DROID RAZR (Verizon), the Motorola ATRIX 2 (AT&T) or the Motorola PHOTON 4G (Sprint). Head over to one of the big box retailer's, uh, big boxes or Best Buy Mobile with a trade-in device, and you can take $50 off any of the trio. In addition, Best Buy will give you a $200 gift card for you to use toward a trade-in when you hand over your old phone. The deals are available only at the brick and mortar stores and expires on May 5th. And one last thing. The savings on the Motorola ATRIX 2 are limited to the $49.99 2-year contract price of the phone. In other words, Best Buy will not pay you for taking this model off its hands.